How to Make Origami kissing lips? Each of us has been inspired by the origami art as a child. And some must have even tried their hands at it by using the manual or some other way to learn how to do it. Origami is a Japanese art that is done by folding paper though it does not originally belong to Japan. Now origami has evolved as an art and is accepted and loved by everyone. The techniques involved in folding the paper have been transcended from generations. And after hundreds of years later now we are able to find the written instructions or manuals about how to do it. To make origami Kissing Lips is not something one would want to do while beginning with origami but once you have ventured into the world of origami art you would love making the origami kissing lips. Making an Kissing lips is one fun activity. Once you learn to make this you will be able to gift it on Valentine’s day or any other day to the one’s you want to gift kissing lips. Step Five– make two diagonal folds on the right and left corners. Step Six – Now make two more folds on both the corners, left as well as right. Crease it properly and unfold. Step Eight – Now repeat the step seven again on the left side. One more time you have to pry open the paper. Push the tip downwards and close the paper back up. Step Nine – after putting all this effort of folding here and there, now we open the paper complete. Step Ten– fold both the sides so that they meet in the center. 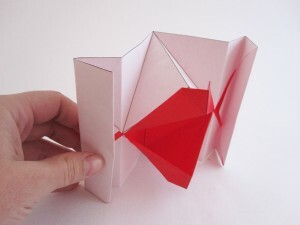 Step Eleven – Now fold the paper in half, crease it properly and unfold. Step Twelve– Rotate the paper to make it horizontal. Now what comes out is he outline of your lips. Now to see the lips move we have to ensure that all folds were right specially the valley and the mountain fold. The folds on the outer side are valley folds and the inner folds are mountain folds. Now if you have done all the folds rightly your red lips should look perfect now. This origami art makes it so attractive and perfect and you can use these origami kissing lips to any good use.